Please refer to this earlier post for background reading. According to the 'ACOTE Entry-Level Task Force Report to ACOTE in December, 2014 (p. 381-393), some stakeholders appear to be 'more equal' than others. 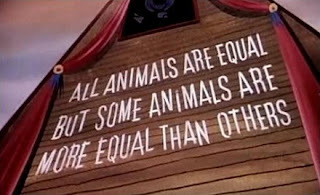 The notion of being 'more equal' is a reference to Animal Farm and the pigs who ran the farm. They famously stated that "All animals are equal, but some animals are more equal than others." In simple terms, the ruling elites of Animal Farm made claims that everyone is equal, but then we discovered that they provided benefits and power and privileges only to their elite comrades. 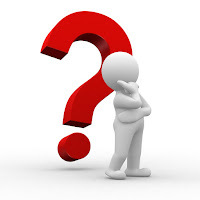 What privileges are handed out by AOTA/ACOTE? The answer can be found starting on page 381. In response to requests for background information on ACOTE’s decision on the entry-level-degree requirement, we are sharing this workbook (see link below). The workbook includes a timeline of events and discussions undertaken by the Council leading to publication of the 2017 mandate statement. It also includes reports, surveys, open hearings, and publications reviewed by the members of the Council in coming to their decision. These materials support both the pros and cons of the entry-level doctorate mandate. The Council took all of these materials into account when making their decision. Part One: Academic Leadership Council Meeting, October 2017 posted here. Part Two: Academic Leadership Council Meeting, October 2017 posted here. This is Part Three of a multi-part report about the Academic Leadership Council meeting that was held in Dallas Texas on Thursday October 26, 2017. 3) Address the perceptions of stakeholders in our communities related to the current and future status of OT education. The morning meeting continued following President Lamb's remarks. Paul Grace from NBCOT followed with a presentation that provided an update on certification issues. The (ultimate) pass rate for OTR candidates is around 98% and for COTA candidates is around 88%. The first time pass rate is lower: approximating the mid 80%s to the 90%s with obvious variation from program to program. There was brief discussion about what states many new certificants are graduating from and where they are seeking their licensing. None of this information was particularly surprising or new. NBCOT will be conducting a survey of academic programs to determine what textbooks are most commonly used across curricula. NBCOT uses this data to serve validation efforts for items that are developed. ***As a commenter below noted, as of 9/22/17 the link to the AOTA infographic with dubious information is broken/has been removed and now serves a 404 error. Hopefully this is an indication that there will be more care in the future about quoting statistics. The removal of the infographic does not address the question about whether or not there may be more impactful injury prevention efforts than concern with wearing heavy backpacks. (edited, 9/22/17, CJA). Unless there are dramatic changes in statistical trends, the New York State Occupational Therapy Association may face insolvency and may be forced into dissolution in the very near future. Two years ago I reported that the NY State OT Association was at a critical juncture. At that time, only 4.4% of all NY practitioners were members of the group. During the period of time from 2006 through 2014 NYSOTA OT/OTA membership declined 24%. The decreasing trend of participation is continuing. According to publicly available financial information (Form 990), NYSOTA's net assets are in free fall. OT History in Clifton Springs! A group of people made OT History today - pulling off an amazing day of celebration in Clifton Springs that was enjoyed by so many attendees. Eighteen months ago I started corresponding with Steve Egidi, an occupational therapist and Vice President of the Clifton Springs Chamber of Commerce. 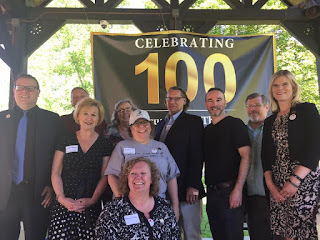 He invited me to join a working group that was forming to help make plans for the 100th OT Anniversary Celebration in Clifton Springs. Steve was a steady organizing force for the group and it was a real pleasure getting to work with him. Also from the Chamber was Jeff Criblear, President of the Clifton Springs Chamber of Commerce. Jeff did amazing work with restoring the 50th anniversary plaque and also helping to coordinate so many of the Centennial celebration activities with the Clifton Springs community. A fairly standard component of my pediatric occupational therapy evaluations is to ask the child to draw a picture of themselves. This assessment technique provides an opportunity to evaluate the child's skill with writing and also is a functional assessment of their cognitive and perceptual ability. Sometimes kids draw things that just beg to be probed and questioned - as was the case recently. I watched intently as 6 year old Patrick drew a representation of himself, but then he began adding odd details to his picture. 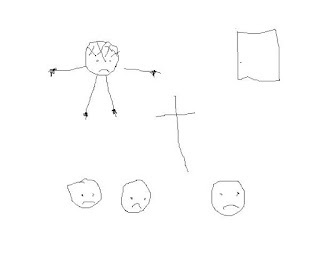 First he colored dark spots on his figure's hands and feet, and then added a row of X's across the forehead. I leaned forward and quizzically asked, "Patrick, what are these marks here?" He looked at me for a moment and then responded: "Jesus died for you, you know. He got nailed to a cross, in his hands and his feet. My Dad said that he had to wear prickers on his head and it made him bleed." This image caught my attention when I attended the Presidential Address at the AOTA national conference in Philadelphia last week, and it has been tweeted around in occupational therapy circles since that time. The question is - what does it mean? 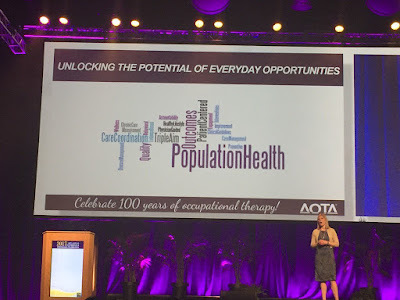 The AOTA president discussed population health as a concept that she believes will be integral to occupational therapy's future vision. Unfortunately, this vision has more to do with a misguided alignment with payment models (Triple Aim) than anything to do with patient care. This unusual vision has been promoted by other occupational therapists and also discussed extensively in this blog here and here and here and here, to link a few. What exactly is the meaning of this word cloud? The initial intent of word clouds was to provide a base narrative analysis of content within written text. Even at their best they are crude, because the words are presented in a decontextualized format. In a recent article appearing on the CNN website, author Wayne Drash reviews the concept of 'wrongful birth' in context of Lesli, a person who has developmental disabilities. Drash's profile states that he "specializes in stories off the radar" and that "his passion is to tell narratives about life and the unfolding drama of the world we live in." It would be more accurate to state that Drash cherry picked one person's perspective and advanced a fiction that serves one ideological perspective. His initial description of Lesli in his opening sentence tells us everything he believes about her person-hood. He immediately goes to the 'fetal position' trope that promotes his message of Lesli's helplessness and haplessness. Hi and thank you for stopping here to look at the poster handouts that are being distributed at the 2017 AOTA conference! If you were unable to get a copy of the handout of the poster presentation, the files below are hi-res JPG scans that you can download and view in a larger format. This version of the timeline is one small step of a multi-year project attempting to document George Barton's life. 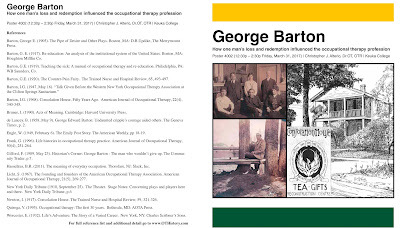 I was always struck by the fact that his life story was documented in such a limited way as compared to other occupational therapy founders. The lack of previously published information on Barton motivated my effort. Having personal geographic proximity to Clifton Springs made the project interesting from that perspective as well. The Governor's 2018 budget proposal adds new requirements on insurance companies and providers. Under other circumstances, a provider or fiscal intermediary would simply operate within the available rules that exist in the private marketplace, but since the State has designated a fiscal agent that is unable to compete in the free market, the Governor is forced to rewrite insurance laws in order to facilitate payment. ...but you might delay things just a little while because of winter weather! Today a gathering was scheduled in Clifton Springs for a celebration of the occupational therapy founding. The mayor was also scheduled to issue a proclamation but the celebration had to be postponed due to inclement weather. The event will be rescheduled. The March 8. 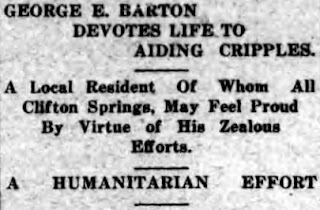 1917 Clifton Springs Press had an announcement about the upcoming First Consolation House Conference, but it also had an interesting article about George Barton. The subheadlines and text of the article are notable because they provide direct evidence of exactly how the Clifton Springs community felt about his efforts and also how influential he was. Studying historical phenomenon is helpful for framing modern problems - and so I would like to draw attention to an article that appeared in Modern Hospital in September 1922. The author of the article, Christine Newman, was Head Aide of the Howell State Sanatorium for Tuberculosis in Howell, Michigan. The facility is described as "a self-sufficient entity that aimed to meet the patients' and employees' every need with a working farm, apple orchard, convenience store, post office, water and heating plants and kitchen staff." This model of 'self sufficiency' was common among asylums and sanitariums in the 19th century. I would like to recommend Dr. Katherine Ziff's book Asylum on the Hill as well as her blog; these resources are invaluable to understanding a model of asylums during this time period and offer a counterpoint for understand modern institutions.